Starting out as a one person shop in 1979, The Marshall Group (TMG) was incorporated in 1982, and began to grow. TMG has been the leading pioneer and thought leader in collaborative leadership and culture change, based on its award-winning Collaborative Method(sm), which enables leaders, teams, and organizations to achieve superior and sustainable results and trust through collaborative principles, practices, and processes. In 2014, TMG became an LLC. What follows is an overview of the evolution of this business. Our focus on collaborative leadership began in the ’70s when Dr. Marshall worked for the Ford Foundation in India. Here he discovered the power of culture as a driver for human behavior. In 1979, he created the Community Development Collaborative to bring collaborative leadership to public sector organizations. The Marshall Group, Inc. was then founded in 1982, as a leadership, team, and organizational collaboration consulting firm that began applying its culture-based approaches to leadership, large scale change efforts, and leadership development strategies. In 1989, we began working the the DuPont Corporation, with our first project being the integration of three petrochemical IT organizations into one in the Gulf Coast of Texas. It was here, working with senior leadership to create “Information Systems Gulf Coast”, that we created the initial framework for a collaborative, team-based organization. By 1991, after winning the American Society for Training and Development’s Excellence in Organization Development Award, that we realized the importance of collaborative leadership as an alternative to the more traditional command-and-control, siloed organization approach. By 1992, in our pioneering work at DuPont in collaborative integration of two business units into a multi-billion dollar entity, we began to see patterns in how collaborative teams formed and organizational change could be successfully implemented. We began to codify the methodology, culminating in the service-marking of The Collaborative Method(s). mmThis leadership and organizational change methodology enabled senior leadership, project teams, departments, and entire companies to transform their existing culture into a collaborative leadership culture by applying collaborative principles and practices to the solution of real-work-in-real-time business challenges. At the same time, we perfected a process for building self-sufficiency skills, called Collaborative ChangeMasters(c) since our clients wanted to sustain the culture change by themselves. Here we learned the power of co-creation and ownership of work processes, which then became central to our approach to collaborative leadership. By the mid-90’s The Collaborative Method(s) became a Best Practice at DuPont. 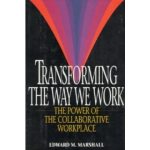 In 1995, Dr. Marshall’s first book was published by the American Management Association. Transforming the Way We Work: the Power of the Collaborative Workplace quickly went viral becoming a Knight-Ridder Best Seller; it was AMA’s Spring Member Selection that year, was the Dual Main Selection of the Newbridge Executive Book Club, and was nominated for Book of the Year by the Society for Human Resource Management. During the 90’s and on into the first decade of the 2000’s, we applied elements of The Collaborative Method(TM) leadership teams and change processes at companies like Marriott, Host Marriott, Conoco, Bethlehem Steel, Acxiom, and US Airways. We learned that to build trust in the workplace, and to successfully implement any change initiative, leadership needed to have three critical attributes: Character, Will, and Discipline. With this in mind, Dr. Marshall began writing his second book. By 2000 business had moved beyond business re-engineering and entered a new era of intense international competition which required new approaches to leadership and change. These were, and still are, times of market complexity, uncertainty, ambiguity and constant change. Interdependence and the ability to collaborate across boundaries of all kinds, whether they were in the matrix, across time zones, or across multiple cultures, meant we had entered an era where collaborative leadership was now even more important. 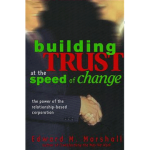 The Marshall Group responded, with the publication of Building Trust at the Speed of Change: the Power of the Relationship-Based Corporation, which was published by the American Management Association and quickly became a Knight-Ridder Best Seller. Dr. Marshall had also begun a leadership column in 1997 called In the Workplace published by American Cities Business Journals, first in the Research Triangle of North Carolina, and then was nationally syndicated. The purpose of this column has been to listen to the needs of leadership and the workforce, and provide thought leadership and practical tools that can help them become more collaborative. With the rise of social media, enterprise collaboration, and virtual computing came new challenges on how to build trust and ownership when people are not working face-to-face. We have learned that there is an important distinction in how we talk about collaboration. Software and the internet provide the medium for digital collaboration. People everywhere are working with each other digitally to solve problems, complete projects, and work across boundaries. There is now a revolution in transparency and openness that requires, more than ever, leadership collaboration that can build the trust and ownership needed to ensure the success of digital collaboration. Without trust, alignment across the organization on vision, mission, and strategy, companies may find their performance to be sub-optimal. Harnessing the power of both leadership and digital collaboration positions a company for leadership in a global, matrixed, rapidly changing world. To meet this challenge, Dr. Marshall created a way for leadership teams and organizations to work virtually. He adapted the tools and processes in his Collaboration Service Suite(C) so they can be used in the virtual and digital space. Another tool he developed is called Collaboration Explorer(TM) which enables teams and organizations to define for themselves what their collaborative culture will look like, and the actions they can take to create and sustain it. This product was developed in partnership with the Center for Creative Leadership. Since the beginning of The Marshall Group, we have come to appreciate the central role of trust and ownership as central principles and practices for any collaborative leadership culture. We are now a member of the Trust Across America Alliance, are affiliated with The Leadership Trust, and are continuing to enhance our service offerings so that they strengthen leadership collaboration. For his work in building trust-based teams and leadership cultures, From 2011 through 2015 Dr. Marshall was acknowledged by Trust Across America as a Top 100 Thought Leader in Trust worthy Business. In 2015, he was awarded a Lifetime Achievement Award as a Trust Thought Leader.